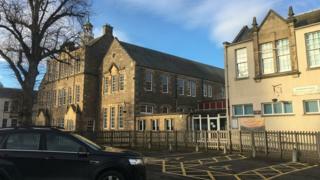 Police have been called out to four separate incidents at a Borders school in the space of a week. It comes amid concerns being raised about whether Hawick High School was "safe and secure". Four teenagers have been charged as a result of the latest incidents between 23 August and 29 August and reports will go to the Children's Reporter. Scottish Borders Council insisted it had generally been a "very positive" start to the term. The police call outs happened barely a fortnight into the new session. The disturbances included an assault on two adults, and a pupil in possession of a weapon. At a council meeting last week Hawick councillor Watson McAteer asked for reassurances about safety at the school. However, he was rebuked by council leader Shona Haslam for raising the issue. In a statement, the council told the BBC incidents within schools were dealt with by staff but "where necessary" police support was requested. It would not comment further, citing a "duty of care to young people" but did confirm it had "generally been a very positive start to the term". The council said any pupils or parents with concerns should talk to school staff. Last year officers were called out to patrol the corridors of the school after a surge in antisocial behaviour.